Practicing kumbhak pranayama with bhavana is a technique of loving kindness, where we develop a mental attitude that is rooted in compassion and love toward ourselves and others. Love is the ultimate expression of God, the Creator. Bhavana means “concentrated thought,” or a loving mental attitude focused on God. This technique on page 68 in my book, Letters from the Yoga Masters, is from Swami Shivananda Saraswati of Assam. It assists us in developing this loving kindness through concentrated thought, focusing the mind and extending love to the gods of the holy Hindu trinity. If one prefers, substitute another aspect of God to fit your personal spiritual path. Indian Sadhaks generally think Brahma, Vishnu, and Shiva—the Gods of Trinity. When they practice these pranayam, with inhale they think Brahma, the Creator, whose colour is like Fire. Fire is the symbol of Creation. When they retain the air (Kumbhak), they think Vishnu, the Preserving Deity, whose colour is Blue. Blue is symbol of Infinite. When the air exhaled, they think Shiva, the Deity of Destruction, whose colour is white. 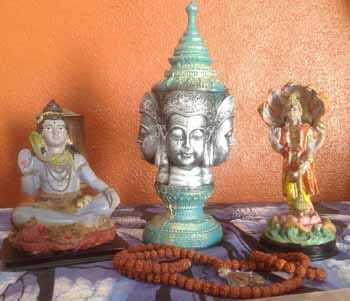 The Hindu Holy Trinity: Right is Shiva, Centre is Brahma, Left is Vishnu. Pranayama can sometimes cause one to feel anxiousness, so be gentle with yourself. It is easier at first to break this pranayama down into stages. You can use a gentle sukha purvak (alternate nostril) breathing, or breathe through both nostrils (in the technique described below I am using sukha purvak). Simply watch the breath in the process, without controlling it. Let the breathing just happen. Practice with a concentrated mind, feeling loving peace extended toward the sacred within yourself. Begin with a few rounds of gentle sukha purvak (alternate nostril) breathing until your mind and body relax. Using Vishnu mudra to seal the right nostril. Inhale slowly through the left nostril and lovingly bring your attention to the solar plexus or manipura chakra. Close both nostrils and retain the breath briefly while loving bringing your attention to the heart region, the anahata chakra. Open the right nostril and exhale slowly through it, and lovingly bring your attention to the space between the brows, the ajna chakra. Now inhale slowly through the right nostril and lovingly bring your attention to the solar plexus at the manipura chakra. Close both nostrils and retain the breath briefly and lovingly bring your attention to the heart at the anahata chakra. Open the left nostril and exhale slowly through it, and lovingly bring your attention to the space between the brows, the ajna chakra. Inhale slowly through the left nostril and lovingly expand the colour red like fire at manipura chakra. This is where the personality resides. Retain the breath briefly and lovingly expand the colour blue at the anahata chakra. This is where the soul resides. Exhale slowly through the right nostril, and lovingly expand the colour white at the ajna chakra. This is where the personality and the soul merge as one. Repeat, completing the round by first inhaling through the right nostril and exhaling out the left nostril. Inhale slowly through the left nostril and lovingly think of Brahma, the creator of all. Sense all of creation around you. Retain the breath briefly and lovingly think of Vishnu, becoming aware of all that you preserve in your life. Exhale slowly through the right nostril and lovingly think of Siva, the destroyer, who removes and transforms all that is no longer needed in your life. Feel yourself lovingly letting go as you exhale. Inhale slowly through the left nostril red flowing prana to the manipura chakra. Lovingly think of Brahma, the creator. Create and expand your loving, compassionate personality. Retain the breath briefly with Vishnu at the heart, expanding the colour blue at the anahata chakra where your soul resides. Lovingly think of Vishnu, preserving your infinite soul and all that is good within you and around you. Exhale slowly through the right nostril the colour white from the ajna chakra. Lovingly think of Siva, transforming the personality as it merges with the soul as One. Repeat, completing the round by first inhaling through the right nostril and exhaling out the left nostril. Continue doing as many rounds as you feel comfortable with. This technique engages the mind, so it does not wander or become distracted. The purpose is to connect the heart and mind through focused attention. Pure love is extended for each of these aspects in one’s life—creation, preservation, and letting go of that which is no longer needed. It is very purifying, and it helps us to accept this natural flow of creation, preservation, and destruction as it occurs in all things manifested, including our personal lives. 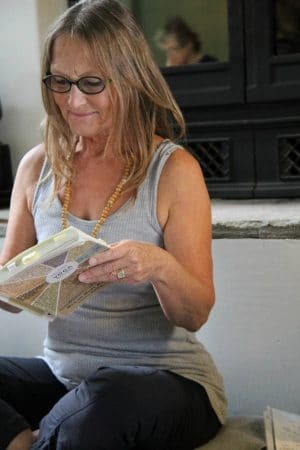 MARION (MUGS) MCCONNELL is a founder of SOYA and published author of her book, Letters from the Yoga Masters. She will be leading a workshop in Ft McMurray in April, Calgary in May and the SOYA Yoga teacher training in Calgary in July. This article is reprinted from her book with permission from North Atlantic Books. [i] Swami Shivananda Saraswati of Assam, Shivananda Yogashram, 471 Netaji Colony, Calcutta, 50, India, Letter to My dear Dickman, April 4, 1966, p.6.